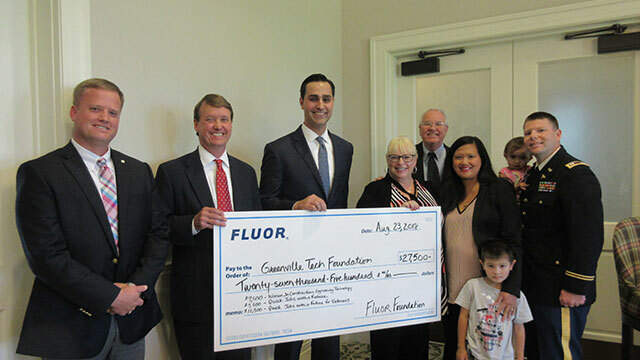 The Fluor Foundation recently donated $27,500 to the Greenville Tech Foundation to be used for scholarship assistance for students participating in the Quick Jobs with a Future program. The Quick Jobs program at Greenville Technical College provides intense, job specific training that prepares a student for entry into career fields with current openings in the Greenville market. Students are able to enter their new careers after three weeks to six months of training. (Left to right) Luke Hardaway, Greenville Tech Foundation board member and HR business partner for Fluor Corporation; Sam Erwin, Greenville Tech Foundation board chair and regional president of IBERIABank; Charles McManemin, general manager, Greenville office, Fluor Corporation; Cheryl Wiggins, senior manager, community and public affairs, Fluor Corporation; Steve Hand, Quick Jobs director; and the Marcus family – Rosezanne and her husband, Russell, with Nathan and Abigail.